Hard Aluminum Anodizing Cabinet Handle are made of 100% aluminium material for better finish and durability. We all know that ever since the invention of stainless steel it has been a favorite metal for house ware and kitchenware items. Apart from decorative and aesthetic part, cabinet handles and knobs are useful in some other ways, such as without a knob or handle, a cabinet door can go through a lot of wear and tear. Some of these doors are opened, closed as much as 30-50 times, and day and even more in case of kitchen and office etc. With such frequent and rigorous use, the cabinets and doors without handles and knobs would get damaged. Their paint and polish along with laminate can become separated or sometimes may get damaged totally. So to prevent wear and tear and to make them more durable and long lasting, Hard Aluminum Anodizing Cabinet Handle should be used on kitchen cabinets. -12" Solid Hard Aluminum Anodizing Cabinet Handle Bar Pull. -8-1/2" hole to hole spacing. -Made with High Quality Solid Hard Aluminum Anodizing. -1" cabinet mounting screws included. -More sizes available (6-inch to 24-inch). 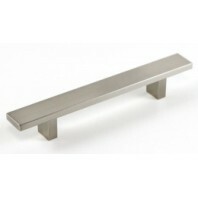 -The smooth clean lines give this stainless steel handle bar pull a sophisticated look. -Universal design matches perfectly with any style of kitchen or bathroom cabinets yet easy to be installed. 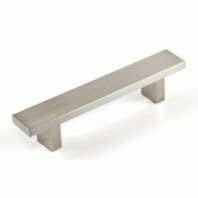 The smooth clean lines give this stainless steel handle bar pull a sophisticated look. Universal design matches perfectly with any style of kitchen or bathroom cabinets yet easy to be installed. · 6" Solid Hard Aluminum Anodizing Cabinet Handle Bar Pull.. 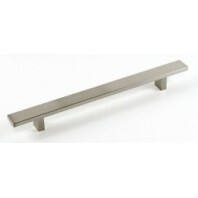 The smooth clean lines give this stainless steel handle bar pull a sophisticated look. Universal design matches perfectly with any style of kitchen or bathroom cabinets yet easy to be installed. · Made with High Quality Solid Hard Aluminum Anodizing. .. 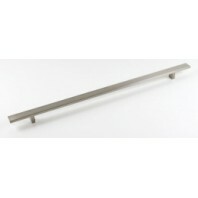 The smooth clean lines give this stainless steel handle bar pull a sophisticated look. Universal design matches perfectly with any style of kitchen or bathroom cabinets yet easy to be installed. · Made with High Quality Solid Hard Aluminum Anodizing. · Stainless Steel Brushed Nickel Finish. ..